Rodney Tennant, well known auctioneer from Leyburn, was the guest speaker at the opening of the 'UNTITLED' exhibition in the Dales Countryside Museum, Hawes. He told some good stories about artwork coming into his saleroom and praised the landscape of the Dales which he knows very well. Over 150 people were present for the opening. 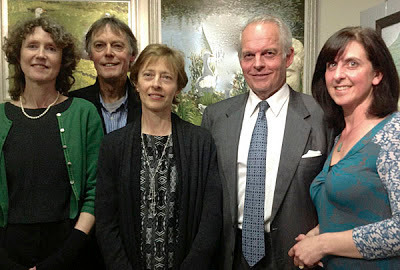 In the photo above (L-R) are Ruth Addinall (sculptor, painter and piano teacher from Gilmerton in Edinburgh, website here), Brian Alderman, Lesley Tennant (Rodney's wife, originally from Toronto), Rodney Tennant (chairman of Tennants Auctioneers of Leyburn), and Fiona Rosher (museum manager, the Dales Countryside Museum). The exhibition has seen good coverage in the local press, and that has helped boost the numbers who have visited. Brian says, "Almost everybody has great things to say about what they see and the visitors' book is filling up nicely. " 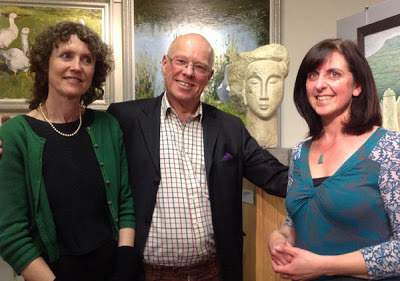 Above: Ruth and Fiona with Piers Browne, a highly respected painter of the Dales, see here. He is author of The Glorious Trees of Great Britain.